I watched a fascinating programme on Chanel 4 a while back . It was a Time Team special on Stonehenge. Archeologists have been working for hundreds of years trying to solve the Mysteries of this iconic monument and finally all the pieces are coming together. 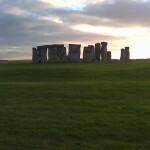 It seems as if wood henge was the site where Life was celebrated and Stonehenge is a place for the Ancestors. For 500 years or so the bones of Roayality were buried within the stone circle. Archeological signs of sky burials, post holes for the platform on which the bodies were laid for Nature to consume, have been discovered.